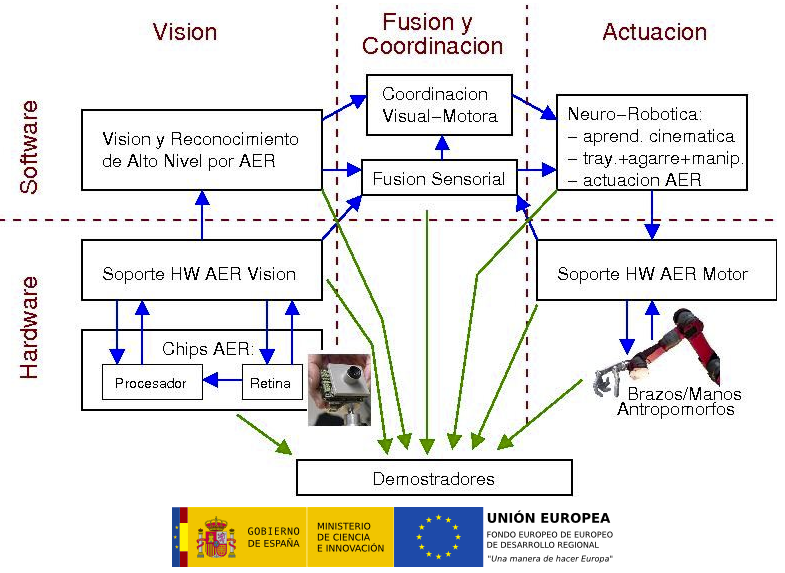 The great potential of the AER (Address Event Representation) technology for very high speed vision sensing and processing as well as for mechanical actuators and motors control in Neuro-robotics has been manifested in prior national and european projects. In conventional vision, a video camera captures sequences of still frames or images, each of which has to be processed by sophisticated algorithms if automatic recognition tasks are desired (in automotion, robotics, etc). AER is based on a different concept which mimics the structure and information coding of the brain. In AER each sensor pixel sends information events when it detects a given level of a visual property (motion, contrast, luminance, …). This way, the sensor output is a continuous flow of information (spatial and temporal) which is not restricted to discrete frames. This continuous flow of visual information is sent to a hierarchical structure, which mimics the neurocortex, and extracts relevant information in a continuous and parallel manner event after event, without waiting for frames. The AER philosophy allows to assemble scalable neurocortical systems: for example, to augment the catalog of known objects one only needs to add more AER modules in parallel which does not degrade speed (as happens in the brain). Presently there exists a reduced but growing number of research groups worldwide working over the AER technology premises. A great variety of sensors (not only visual) have been built, the first neurocortical processing microchips have been developed, and there are starting to appear the first developments for applying AER to mechanical actuation in robotics and other applications. In recent research projects (national and european) the research teams of the present proposal have developed several vision sensors, have developed the first sufficiently generic programmable reconfigurable neurocortical processing modules to allow assembly of neurocortical structures for 3D object recognition, and have contributed to the development of motor control in robotics applications. Very high speed object recognition has been proven, as well as the modularity and scalability properties of AER systems. However, until now, all developed elements are quite experimental, oriented more towards proof of concepts, and without integrating everything for applications of industrial interest. The objective of the present proposal is to perform the necessary steps for developing a set of demonstrators to validate this vision and mechanical actuating sensing and processing technique for applications of interest in the industrial sector. Specifically, two application sectors have been selected. The first one is automotion where we intend to develop a compact and cheap demonstrator capable of performing certain high speed recognition tasks. The second one is robotics where we intend to develop several demonstrators for high-speed visual-motor coordination.